In my younger days, in another life back in the late 70s, I used to work for an all news radio network. I worked two hours on the air, beginning at 6 pm, one off, and a final hour on that was taped to be repeated an hour later. I read the news at the top and the bottom of the hour and filled the rest of the time with either pre-recorded or live interviews. That was a lot of air time to fill and starting my shift in the evening meant most of the newsmakers of the day had already been interviewed by other anchors. What's a guy to do? Well, this guy often turned to supermarket tabloids as a source for his research! I'd review several a day and start trying to track down the subjects of some of these outlandish stories to interview them. According to Wikipedia, the oldest tabloid known to date is the American "Daily News" which originated in 1919. If it did not have any news, it would simply make it up and use a photograph staged by the newspaper staff. No, say it ain't so. And believe me, the subjects of some of the interviews I did were absolutely unbelievable. I was reminded of this aspect of my long ago career the other day while I was standing in line at the check-out in the supermarket. As my gaze fell upon the racks of tabs it brought back warm and fuzzy memories. These days, however, things have changed. Now we have internet gossip tabs such as Gawker, TMZ and the King, er, Queen of Garbage Gossip Perez Hilton. 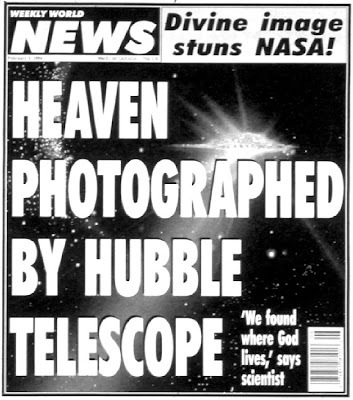 But let's for a moment take a look at the gossip tabloids of the newsprint variety. The National Examiner tells me Oprah is in a love triangle and that poor Stedman said "in a jealous rage: It's Obama or me!" Lord knows it must be true because there's enough of Oprah to go around apparently. I know this you see because I read in The Globe that "TV heavyweight Oprah Winfrey went on a diet earlier this year and actually GAINED weight, sources say. The talk show queen now tips the scales at 245 pounds - or more - according to experts, who fear she will never be slim again." The Globe is also gushing about how Teddy Kennedy killed an innocent young girl (gee, she shouldn't have let Teddy drive), that "cougar" Katie Couric's getting ready to marry her 35 year-old boy toy, and that Judge Judy has had an amazing face-lift. Boy, I'm gonna get my money's worth this week! But I gotta tell ya, my all time favourite trash tab is definately the Weekly World News. Why? Because it has a thing for aliens! That's right. Even though it has stopped publication you can still find sensational tales on the WWN's internet site. Where else can you read about a 600 foot long crop circle in the shape of a jelly fish on a British farm. Or delve into the fascinating fact that aliens helped the Indians defeat Custer (gives new meaning to the term little big man). And still in interplanetary news, they've apparently found Earth's twin and discovered that Mars traded with ancient Egypt. And, dammit, you know these things are all true. After all, if you can't trust the publication that discovered Bat Boy then who can you trust?! 2nd - Bat Boy was the one entity, living or dead or fake, that made me feel better during a very trying time in my 20's. Everytime I though I had it bad, I just pulled out the lastest on BatBoy. Wonder whatever became of him? Hey thanks surveygirl46. You have to hand it to Oprah. Cause her arms are too fat for her to hand it to herself! And re: Bat Boy I was crushed when they said they made him up! I love the old time gossip rags, they always made me feel so much better about my own life. I mean, even at my hairiest, I never even came close to Weregirl!! nipsy: Yeah they did have that affect, didn't they? 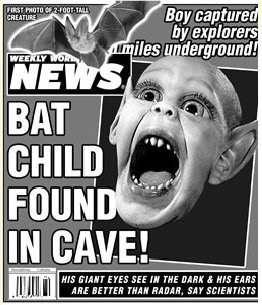 i dont think they really found a bat child in a cave come on how stupid do you think we are publishers... huh?! But it was in the Weekly World News. It's gotta be true. They would't lie about a thing like that, would they?